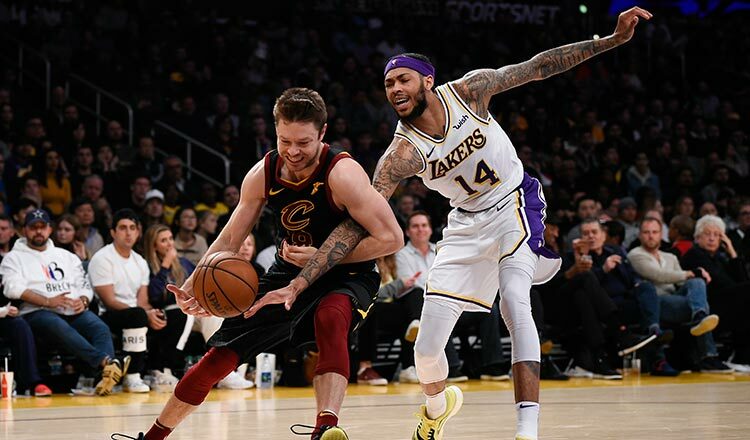 LOS ANGELES (Reuters) – Cedi Osman scored 20 points, and Rodney Hood added 18 as the visiting Cleveland Cavaliers put an end to their 12-game losing streak Sunday, hanging on for a 101-95 victory over the struggling Los Angeles Lakers. Tristan Thompson had 15 points and 14 rebounds, while Alec Burks had 17 points and 13 rebounds as Cleveland won for the first time since Dec. 18 at Indiana. The Cavaliers are just 9-35 this season and remain the only NBA team that has not reached double digits in victories. Kyle Kuzma had 29 points and nine rebounds for the Lakers, as injured Los Angeles forward LeBron James watched his current team face his former team while nursing a groin injury. Brandon Ingram had 22 points for L.A. The Cavaliers got off to a quick start, leading by 15 points with three minutes remaining in the first quarter and never trailed in the final three quarters. Cleveland took a 51-46 lead into halftime, holding the Lakers to 2-of-13 shooting from 3-point range. The Lakers managed to cut the Cavaliers’ lead to a single point less than two minutes into the second half, but the Cavaliers needed less than two minutes to regain another double-digit lead at 61-50 after a 3-pointer from Osman. Los Angeles’ comeback effort was sabotaged by its struggles from 3-point range. The Lakers were just 2 of 12 on 3-pointers in the third quarter and went 7 of 34 (20.6 percent) from distance in the game. They did cut the Cleveland lead to three points twice in the final minute, but the Cavs finished off the victory from the free-throw line. After giving up at least 140 points in each of their last two defeats, and 128.5 points per game in their six previous January games, the Cavaliers held the Lakers under 100 for the third time in seven January games. Collin Sexton had 17 points for the Cavaliers. Lonzo Ball had 13 points for the Lakers, who have won just three times in 10 games without James, who is not scheduled to return to action any earlier than Thursday, when his injury is expected to be re-evaluated. James was injured during a Christmas Day game at Golden State.​When the teams met November 21 at Cleveland, the Lakers rallied from a double-digit deficit for a 109-105 victory, but needed 32 points and 14 rebounds from James to do it.